Tart Clamshell 24 cavity mini cubes. 6 1/4" x 4 3/4" outside dimensions 5/16" x 13/16" x 5/8" cavity dimensions. Clamshells can be used to make mini tart/melt cubes or even your own dye cubes! Each cavity will hold .19oz of wax. The entire mold will hold 4.56oz of wax. Soap Bar Clamshells 8" x 5 7/8" outside dimensions 3 1/16"x 2 5/16" x 1 3/16" cavity. 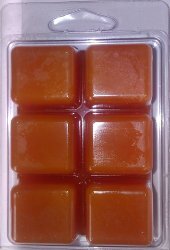 4 rectangle cavity clamshells are perfect for making & packaging 4 bars of Melt and Pour soap! Great for gift sets! DO NOT USE FOR COLD PROCESS OR HOT PROCESS SOAP! Tart Clamshell 6 cavity 1" cubes. 4 1/8" x 2 3/4" outside dimensions 1" x 1" x 1" cavity dimensions. Clamshells are the perfect packaging for making tarts/melts! Holds approx 2.5 weight oz.